Latin is at the cultural and linguistic heart of Western Europe and the Americas. Learning Latin offers senior school and adult beginners access to this shared heritage. 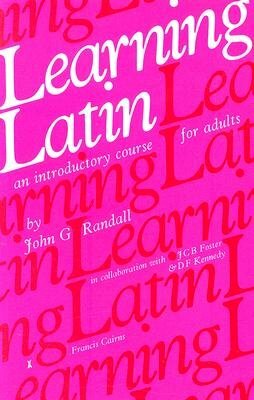 John Randall, over two decades of teaching Latin to beginners at Lancaster University, developed techniques to encourage a rapid grasp of Latin sentence-construction without distortion of the natural Latin word-order. The Learning Latin course evolved from his teaching experience. He collaborated in the final stages of its development with two other experienced Latinists, Jonathan Foster and Duncan Kennedy, who gave the course further rigorous testing at Liverpool University. The course uses only the real Latin of classical authors, both prose and poetry, right from the very first sentence: homo hic ebrius est, from the comic playwright Plautus. Where (minimal) adaptations have been made to the Latin, this is signalled and the original form given in an appendix. The grammatical terminology is traditional, with the addition of two concepts from modern linguistics - 'kernelling' and 'metaphrasing'. The forms of nouns, adjectives, pronouns and verbs are listed in tables. Learning Latin consists of 25 chapters, for each of which around two hours instruction is envisaged. Its aim is to enable students to make sure progress in the structure of the language, so that after completing the course they can handle Latin prose and simple Latin verse confidently with the aid of standard reference works.